Paul Strassmann’s blog: 108. Economics of the International Stock Market - Where to Invest? 108. Economics of the International Stock Market - Where to Invest? A steady growth of the financial markets in the world has occurred since the end of WWII. Since 1950 limiting stock market trading to the US appeared to be preferred option. However, since the failure of US financial markets in 2007 new international investment opportunities become available. The purpose of this blog is to examine the newly emerging options for investor portfolios. 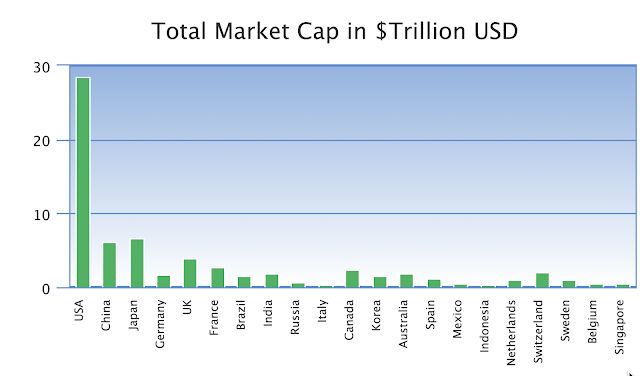 The present capitalization of the world's stock market is about $100 Trillion. Where should an investor diversify their investments? 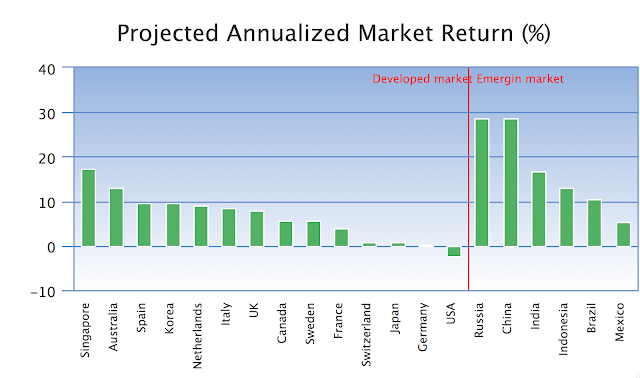 Investment returns for different countries show great variability. The conventional approach is to purchase US financial assets consisting mostly of domestic stocks and bonds. Until now the US stock market offered the greatest choices because it accounted for up to a third of the total global market capitalization. Alternatives, such as China, Japan, UK, Canada and Switzerland offered only a fraction of the pool available for trading. The size of the total global asset pool is only partially related to financial wealth. Real-estate holdings as well as valuables would have to be also included. That will be discussed in future blogs. 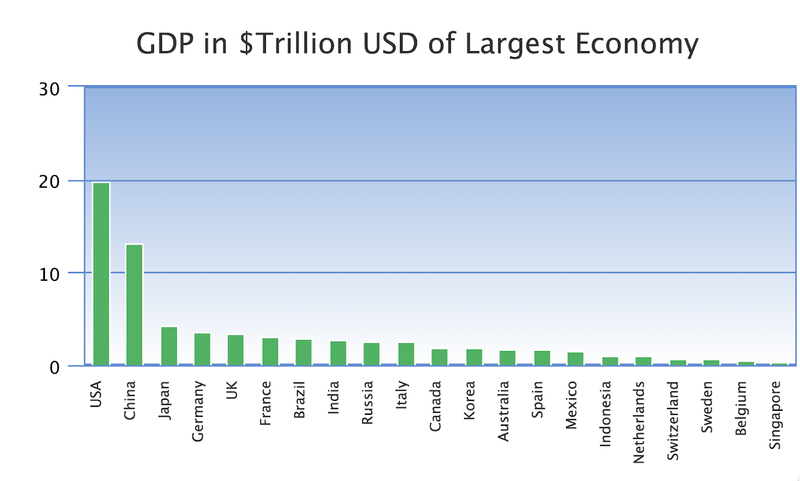 With close to 30% of the total market capitalization of the world owned by the US, the next largest opportunities for trading are in China, Japan and UK. All other countries offer only much smaller trading pools. High prices on US stock exchanges make the valuation of US investments excessive when compared with others. That shows up as depressed levels of the projected market returns. These projections are optimistic because they estimate market returns are measured by the Shiller CAPE ratio, which is based on the prices of every stock divided by the average of ten years of earnings, adjusted for inflation. 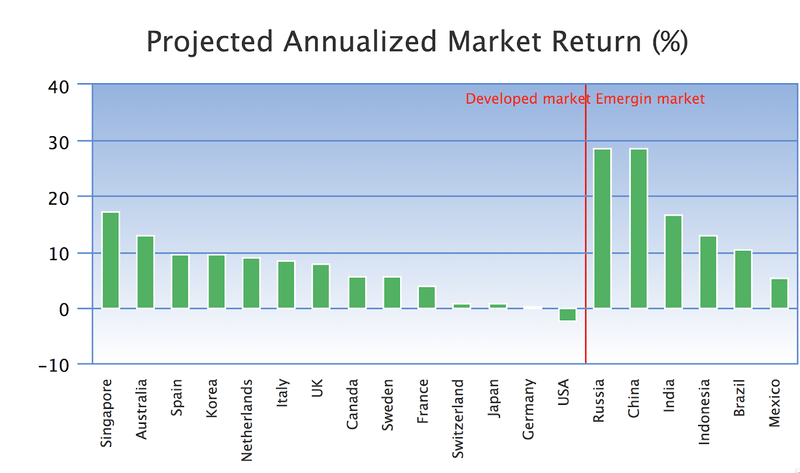 There are differences between conservative market returns reported for developed markets, such as Singapore and Australia as compared with high market returns for emerging markets, such as Russia and China. Does that mean that investor choices should be shifting from well capitalized as well as low return investments to poorly capitalized markets that offer higher returns such as is available in Russia? #1: Ranking by market cap: USA=30; China=6; Japan=7. 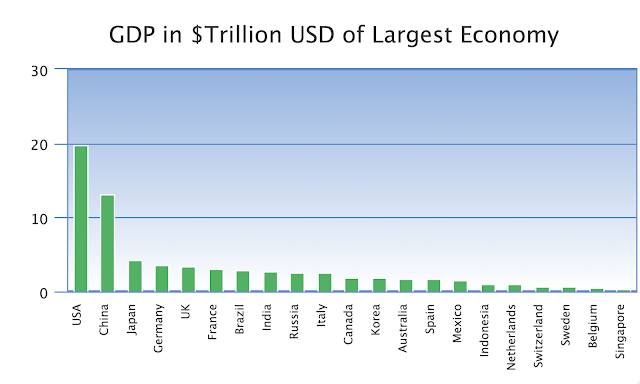 #2: Ranking by GDP: USA=20; China=12; Japan=3. #3: Ranking by market return: Russia=28; China= 28; Singapore= 17. #4: Ranking by GDP growth rate: India= 13; Russia=12; China=13. A sum of these rankings should give us an idea how to revise portfolio investments: When summing up decision rankings China scores 59 and US scores 50. 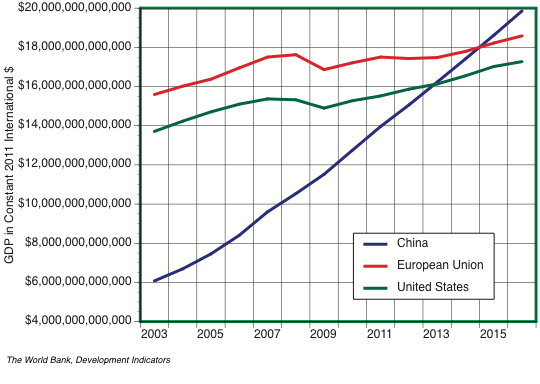 For diversification of portfolios investors should reduce investments in the US and increase in China as indicated by the following chart that indicates that China has already overtaken the USA and European community in terms of GDP. 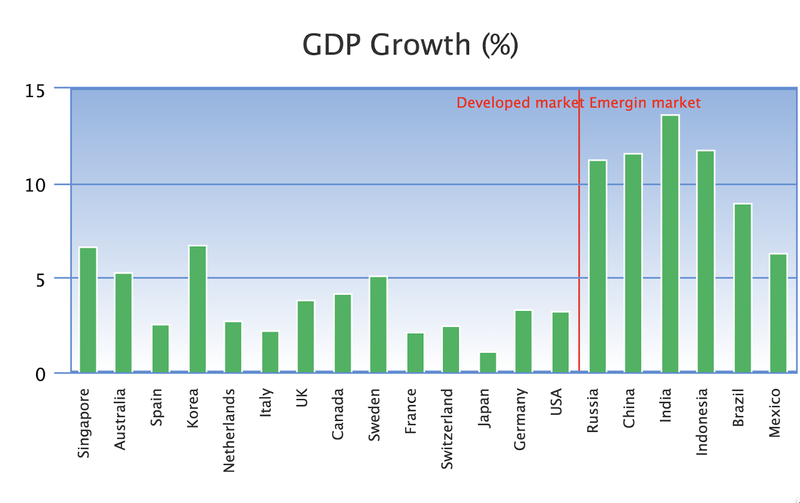 At current rate of growth the superior performance of China should be considered as investment portfolio guidance. Current shifts in global trade that favor China should influence a re-allocation of a significant share of funds to China.